Another Woodland Wednesday and another day of discovery at Highbury Park. Jay's displaying but silently, Great Spotted Woodpeckers' feeding their young, a Jackdaw drinking from the stream, Blackbirds and Song Thrushes singing all around and not a peep from the Ringed Neck Parakeets. 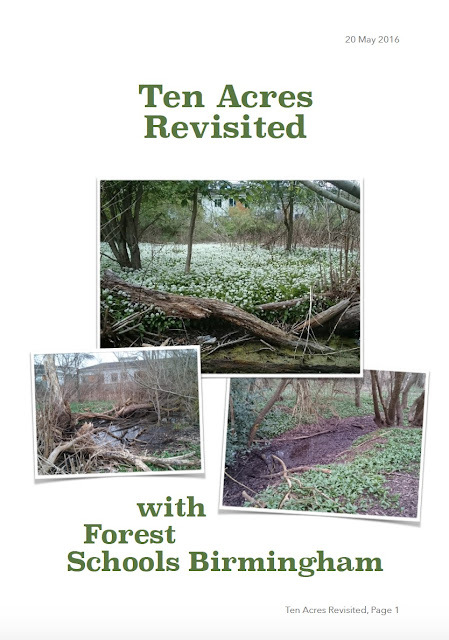 Woodland Wednesdays are the perfect way to hold consultation with parks users and there sure is plenty to talk about. On the whole our interests are biological but other factors are in play not least the exciting possibilities posed by the recently formed Chamberlain Highbury Trust. A cool day, yet dry, so nothing to complain of, on the contarary, it was a day for standing around and watching nature at play in the park. The width of the hedge is now around 2.5 metres, developing the habitat, which consists of more than the shrubs. 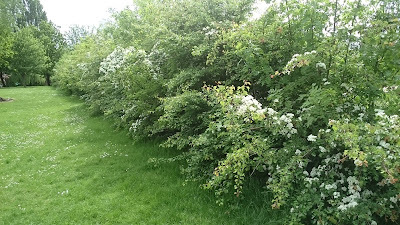 The density of the hedge, together with its shading and sheltering potential, currently makes it particularly suitable for nesting birds such as Blackbird, Song Thrush and Dunnock. Nests from previous years can be seen during winter. As the hedge grows, and thus thins out at the base, laying will be considered once again, this should occur around 2020.